Trieste. 15 September 2017. – The International Provisional Representative of the Free Territory of Trieste – I.P.R. F.T.T. has celebrated with an official Statement and publishing the documents of two particular legal actions the 70th Independence Day of the little State and international Free Port established with the Treaty of Peace with Italy, which came into force on 15 September 1947. The I.P.R. 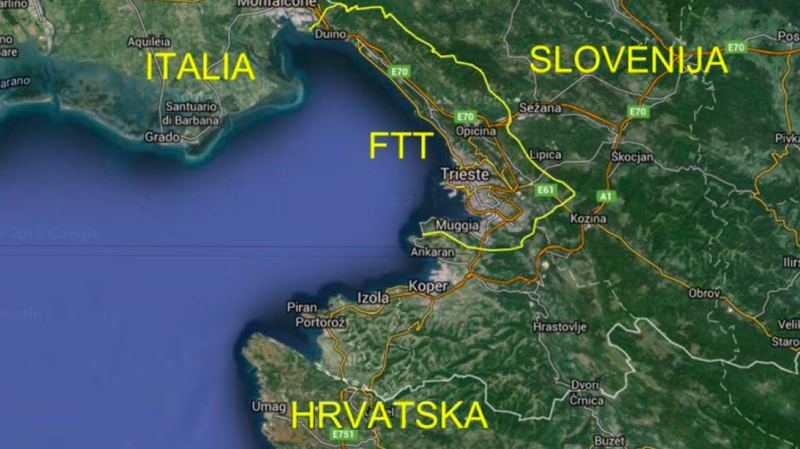 F.T.T., established at the initiative of the Free Trieste Movement is an international legal subject active since September 2015 as agency for representation upon direct delegation of the citizens and enterprises of the present-day Free Territory and of other States (LINK) with legal and political-diplomatic actions that are already achieving factual results. Among these, the fact that the Italian Government had to admit, with the Decree of 13 July 2017 concerning the management of the free zones of the international Free Port that it is still exercising the sub-mandate of temporary civil administration over the present-day Free Territory of Trieste, which was entrusted to it in 1954 by the Governments of the United States of America and of the United Kingdom, on behalf of the United Nations (LINK). The official Statement of the I.P.R. F.T.T. in Italian and in English on the 70th Independence Day of Trieste summarizes the legal and political-economic question of the Free Territory, of its international Free Port and of the related rights of the other States (LINK). The text of the Statement does therefore provide to public opinion, to the observers, as well as to investors information that, instead, is systematically censored or distorted by the Italian political system and media. The first document now published by the I.P.R. F.T.T. is the act of 22 May 2017 with which it summoned before the Court of Trieste the Italian Government and its Fiscal Agency to verify whether they have the title to establish and collect taxes in Trieste in the name and in the budget of the Italian State, or in the name and in the budget of the administered Free Territory (LINK). The difference is not in name only, it is factual and very relevant for the people and the enterprises, because the Italian taxes illegally collected by the administering Government are two to three times more burdensome than those that can be levied in the administered Free Territory. This legal action for demonstration is based on the international and domestic obligations of the Italian Republic, as a signatory State of the Treaty of Peace, and of the Italian Government, as temporary civil administrator of the Free Territory. The expertise about the Italian normative corpus on this subject and about the laws extended to the administered Free Territory will be published at the opening of the discussion before Court. The first hearing is scheduled for 27 November 2017, but it appears that the legal action is already successful, because the Italian Government has also recognized officially, with the decree of 13 July about the Free Port, that the Free Territory of Trieste is an independent State under provisional administration. And, as such, it cannot be subject to the taxation of another State. The citizens and the enterprises that join this legal action to support the claims of the I.P.R. F.T.T. with a simple legal act can also use the lis pendens immediately, to defend themselves in their own legal disputes revolving on taxation, asserting it also in fiscal legal action or requesting it be registered in the Land Registry Book to protect properties at risk (the interventions in this legal action are care of the Free Trieste Movement: LINK). This is why hundreds of citizens, residents and enterprises of the Free Territory and of other States are joining this legal action, while other people, enterprises, and law firms and accounting consultancies are requesting to read and study the writ of summon, which now is finally accessible for all. The second legal act published on 15 September 2017 is an Invite to enforce the law concerning ownership and administration of the international Free Port of the present-day Free Territory of Trieste notified by the I.P.R. F.T.T. to the President and to the Prime Minister of the Italian Republic, and to the main subordinate administrative and judicial Authorities, each for their respective competences, on 14 September (LINK). This act does officially open the legal dispute about the matter, inviting all Italian Authorities to comply and to enforce the legislation in force, as well as to urgently repeal all illegitimate legislative acts with which they violated the provisions of domestic and of international law that regulate the ownership and the management of the International Free Port. If the Italian Authorities won’t comply with the invite of the I.P.R. F.T.T. voluntary, the legal dispute shall be initiated before the pertinent international Authorities. The document and the normative corpus it recalls are especially interesting for all investors and enterprises that work or are willing to work in the International Free Port of Trieste. For instance, in this case compliance with the law is not just a principle, rather, it must be factual, granting legal certainty, which is the necessary condition to invest in the activities of the Free Port. Indeed, port concessions and investments within the Free Port of Trieste that violate the international laws that establish it as well as of the obligations of the regime of provisional administration can be put in question and paralyzed at any time by different kinds of legal action brought forward by competitors (enterprises, investors, or competing ports) as well as by States with opposite strategic interests. The request of the I.P.R. F.T.T. that the Italian provisional administration regulates the ownership and the management of the International Free Port of the Free Territory of Trieste does therefore represent and defend the legitimate interests of the investors and of the enterprises of all States.